Our main target storm type is the supercell! Supercell thunderstorms are a special kind of single cell thunderstorm that can persist for many hours. They are responsible for nearly all of the significant tornadoes produced in the U.S. and for most of the hailstones larger than golf ball size. Supercells are also known to produce extreme winds and flash flooding. Supercells are highly organized storms with characterized updrafts that can attain speeds over 100 miles per hour. These storms are also able to produce extremely large hail and strong and/or violent tornadoes, as well as downdrafts that can produce damaging outflow winds in excess of 100 mph – all of which pose a high threat to life and property. The most ideal conditions for supercell formation occurs when the winds are veering or turning clockwise with height. For example, in a veering wind situation the winds may be from the south at the surface and from the west at 15,000 feet (4,500 meters). This change in wind speed and direction produces storm-scale rotation, meaning the entire cloud rotates which may give a striated or corkscrew appearance to the storm”s updraft. Dynamically, all supercells are fundamentally similar. However, they often appear quite different visually from one storm to another depending on the amount of precipitation accompanying the storm and whether precipitation falls adjacent to, or is removed from, the storm”s updraft. Front Flank Supercell – High precipitation (HP). In LP supercells, the updraft is on the rear flank of the storm. A barber pole or corkscrew appearance of the updraft is possible. Precipitation is sparse or well removed from the updraft and, often, it is transparent and you can”t see it. Large hail is often difficult to discern visually as well. Furthermore, there is no “hook” seen on Doppler radar. The majority of supercells fall in the “classic” category. 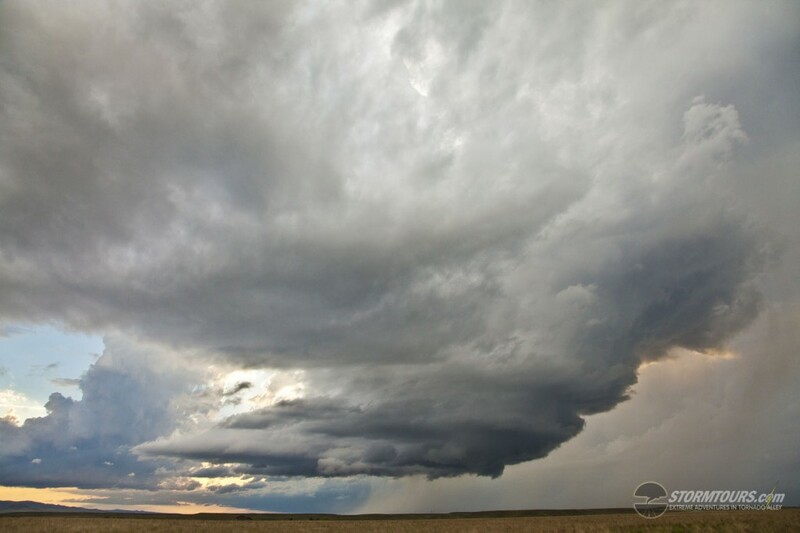 These have large, flat updraft bases, generally have a wall cloud with it, striations or banding can been seen around the periphery of the updraft, heavy precipitation falls adjacent to the updraft with large hail likely, and they have the potential for strong, long-lived tornadoes. extremely heavy precipitation with flash flooding. 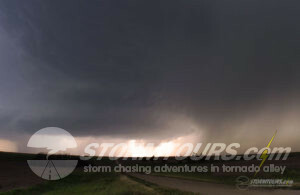 Beneath the supercell, the rotation of the storm is often visible as well. The wall cloud is sometimes a precursor to a tornado. If a tornado were to form, it would usually do so within the wall cloud. Wall clouds are isolated lower clouds below the rain-free base and below the main storm tower. Wall clouds are often located on the trailing flank of a storm. With some storms, such as high precipitation supercells, the wall cloud area may be obscured by precipitation or located on the leading flank of the storm. Next, let’s discuss Wall Clouds.